Sometimes health promotion is being planned for a population. 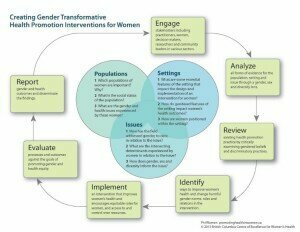 The planning tool poses specific questions related to populations (see central circle in planning tool figure) which facilitate intersectional analysis, and supports a more complex approach to Analysis, Review and Identification steps. These questions prompt a closer analysis of the “population” that highlights differential issues and needs among girls and women. Health promoters may be considering interventions that address the needs of certain populations of girls and women such as girls who are facing pressures to drink alcohol, and who are showered with alcohol advertisements for coolers and “bikini friendly” beers (12) that promise health, low caloric content, and sexual prowess (13-14). Health promoters may be considering interventions that address the multiple needs of Aboriginal women who are pregnant and who smoke, (a recent Canadian study by Heaman and Chalmers (15) found that 61.2 percent of pregnant Aboriginal women smoked compared to 26.2 percent of non-Aboriginal women). Aboriginal pregnant women who smoke are more likely to be young, single, experience low-income and less education, to use alcohol and illicit drugs, to have inadequate prenatal care and suffer from physical abuse and violence, low self-esteem and lack of social support.